With fall now officially here, thoughts are turning to harvest. And with each acre harvested, there is potential for a cover crop to be seeded. At this point in the season, the main cover crop option left is cereal rye. 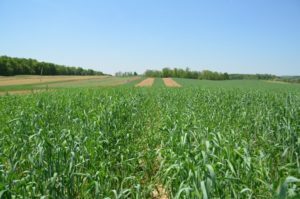 Not to be confused with annual ryegrass, rye is a cereal that is competitive, winter hardy and, like winter wheat, does its real growing in the spring. Rye improves soil structure, reduces nitrogen losses from leaching, builds organic matter and helps protect against water and wind erosion. It also competes with weeds (see Figure 1a and 1b). It is relatively inexpensive and easy to kill. Rye’s best fit in a field crop rotation is following silage or grain corn and before soybeans. Since it grows very little in the fall, it should be left to overwinter. Rye can be reliably established in most parts of Ontario up to the first week of November (mid-November for Kent, Essex and Lambton Counties). Drilling is best. If broadcasting rye, consider some light incorporation afterward to improve seed-to-soil contact. Seeding rate depends on your objectives. Do you want a thick stand to provide a mulch in spring or just enough to provide some soil cover over winter? You can use the Midwest Cover Crop Council’s Cover Crop Decision Tool to determine an appropriate seeding rate. 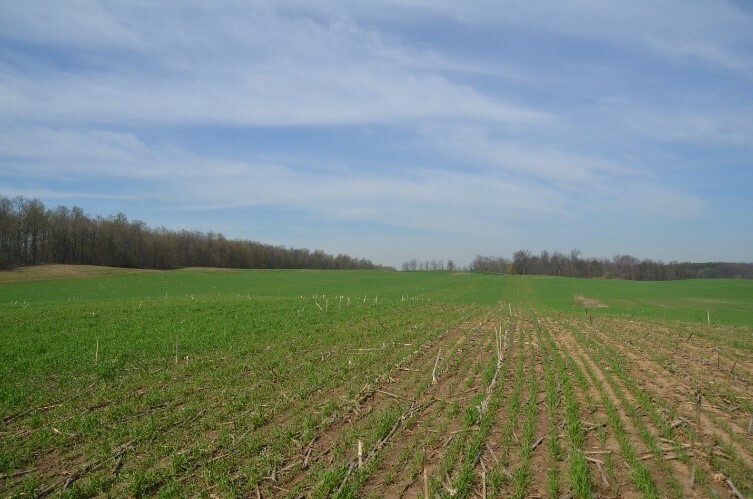 If you plan to seed slightly past the optimal window, bumping up your seeding rate and drilling the rye will help increase the likelihood of an even stand come spring. 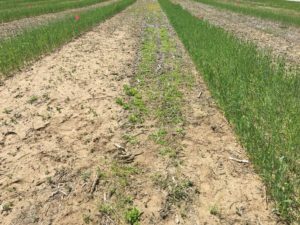 Cost-benefit: what is the impact of rye on yield and soil health? On-farm research by Iowa Learning Farms and the Practical Farmers of Iowa has shown that across 28 site-years, a cereal rye cover crop prior to soybeans increased yield in 8 cases, decreased yield once and did not affect yield in the remainder of the trials (Figure 2). 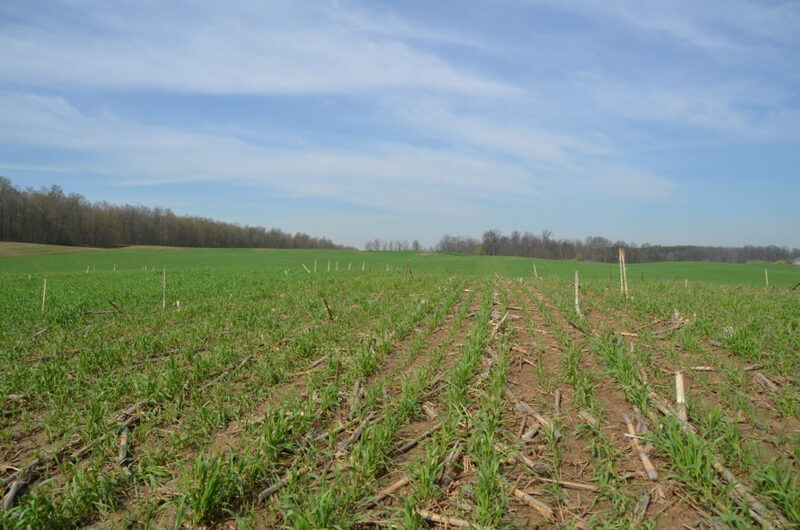 Across these trials, cover crops were typically terminated 7-10 days before planting. 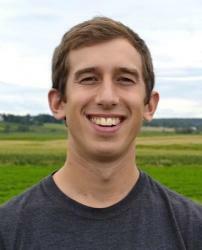 The same study, however, did not find an improvement in organic matter or organic nitrogen after 7 years of a rye cover crop compared to no cover crop in a corn-soybean rotation. Though rye can have an immediate impact by reducing soil erosion and nutrient leaching, soil properties do not change overnight. 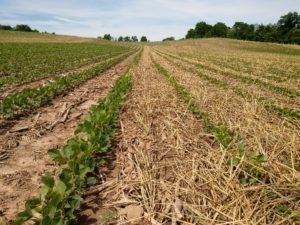 Delaying termination up until soybean planting provides an opportunity to accelerate rye’s soil benefits by giving it more time to grow in the spring. The question is, does planting soybeans “green” into rye negatively impact yield? 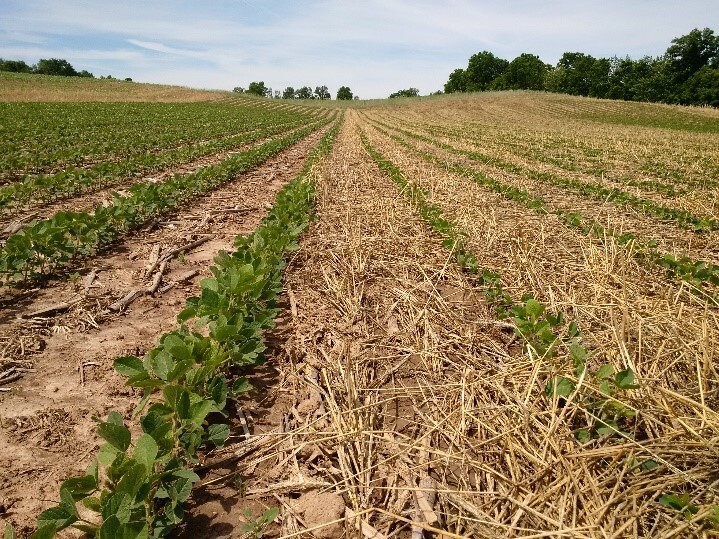 This is the motivation for a series of on-farm trials with Brant County SCIA, in which soybeans grown after early-terminated rye are being compared to those “planted green” into rye. For the complete report on these trials, including yield data, click here. Across 4 sites, rye biomass increased on average by 4.3-times when terminated at time of soybean planting compared to ~2 weeks prior (Table 1). Table 1. Rye biomass (dry) at early versus late termination timings across all sites. Rye seeding rates ranged from 30-90 lbs/acre. 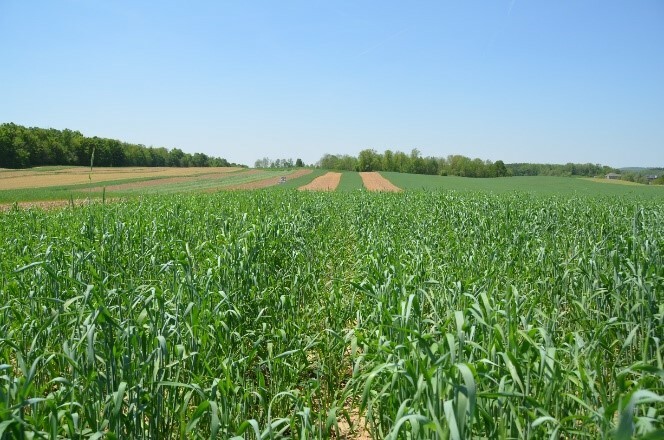 At the site with the greatest amount of rye biomass, Brantford 2018, allowing an extra two weeks of growth resulted in an extra 48 lbs/acre of nitrogen scavenged by the cover crop – from 12 to 60 lbs/acre (Figure 3). Nitrogen taken up by rye is released slowly over the season and is less likely to be lost to the environment. Since soybeans fix their own nitrogen, this uptake does not affect the crop. Figure 3b. 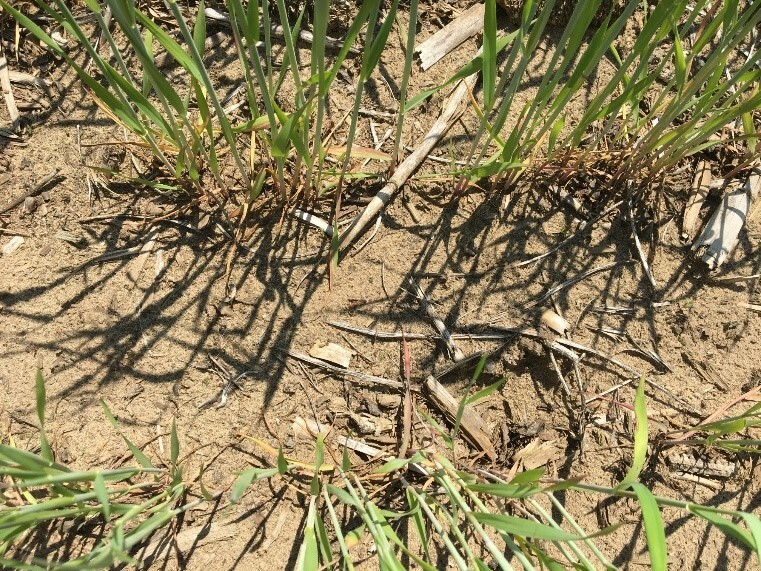 Cereal rye growth on May 25, 2018 at Brantford site. Delaying termination of rye does not come without some risk. Soybeans stands were reduced at some sites (Table 2). Figure 4. Soybeans at the Brantford 2018 site on June 26. Soybeans “planted green” into rye (right) were one growth stage behind and shorter than those planted into early terminated rye (left). It is particularly important to plant into moisture and ensure that the seed trench is closed. 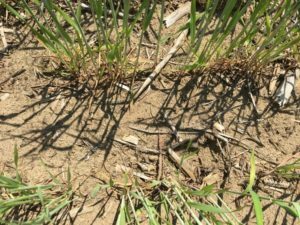 Also, if conditions are very dry leading up to planting, terminate rye early to avoid planting into even drier conditions. Soybeans in later-terminated rye also tended to have delayed development. Across all sites in 2018, plants were consistently one growth stage behind in the “plant green” plots (Figure 4). 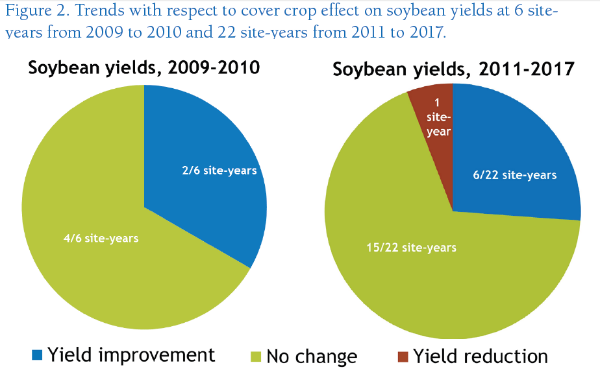 Soybeans are adaptable, to a point, to reduced stands and moderate delays in development. Also, rye residue provides a mulch that helps to conserve soil moisture. Read the full, updated article for yield results. Consider seeding rye this fall. Gain confidence by terminating it a couple of weeks before planting soybeans in the spring. If you’re more experienced, leave a strip to be sprayed after soybean planting this coming spring and see how it works on your farm. Have a goal in mind – is it weed management, building organic matter or overall soil health? And finally, be flexible and adapt your plans according to weather conditions. 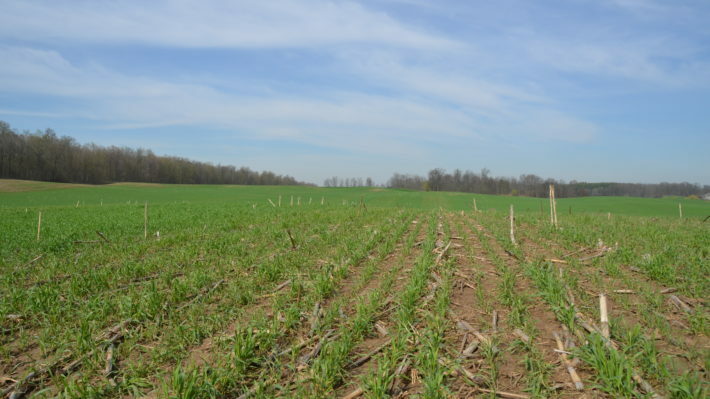 Starting this fall, an OSCIA Tier Two project by Heartland and Eastern Valley regions will look closer at the effect rye on weeds, crop yield and more. 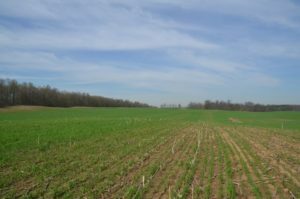 The two-season project will evaluate the use of a roller crimper for termination of rye and look deeper at the question of termination timing in the spring.